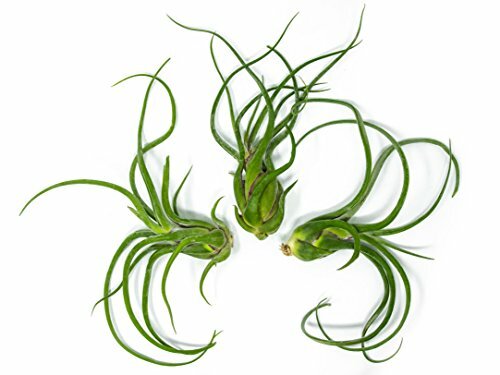 Caput Medusae air plants are named for their resemblance to Medusa, the Greek goddess famous for her hair made of snakes. Also known as an “Octopus” plant, this plant features long, tentacle-like leaves that grow in a swirling pattern up from the base. We are thrilled to offer this highly unique and sought-after air plant at a truly impressive size of 8 to 10 inches in height. BEAUTIFUL AIR PLANTS AT THE LARGEST SIZE AVAILABLE: Our Giant Caput Medusae air plants are huge, mature plants that have been growing for several years and are rarely seen for sale. DIY HOME DECOR: Air plants are perfect for terrariums, cages, and glass containers with holes or gaps that allow for plenty of air flow. There is a myriad of other creative ways to display air plants; the possibilities are limited only by your imagination.